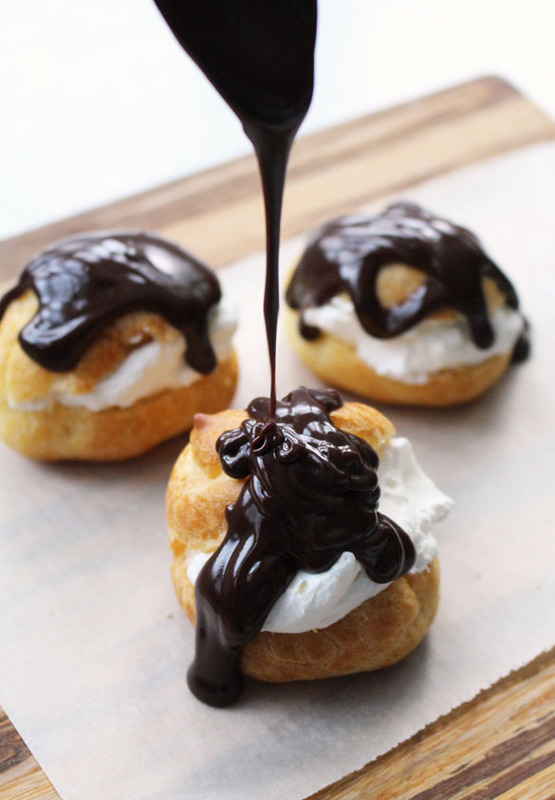 Makes: Makes 1-2 dozen cream puffs. 2In a medium saucepan, bring the water, butter and salt to a boil; remove from heat and stir in the flour, stirring vigorously until the dough comes together and cleans the side of the pan. 3Transfer to a bowl and beat in the eggs one at a time, mixing well after each addition. Set aside for about 10 minutes and then drop spoonfuls of batter onto a parchment-lined baking sheet; bake for 20-30 minutes (depending on the size of the spoonfuls) until puffed and golden. Immediately poke a hole in the side of each one with the tip of a sharp knife or a bamboo skewer. Cool completely before filling.